DettifossIT Services distinguished itself as the leading Service Now Training Institute in Hyderabad. Our Service Now Training Consultants or Trainers are highly qualified and Experienced to deliver high-quality Service Now Classroom and Online Training across Hyderabad. 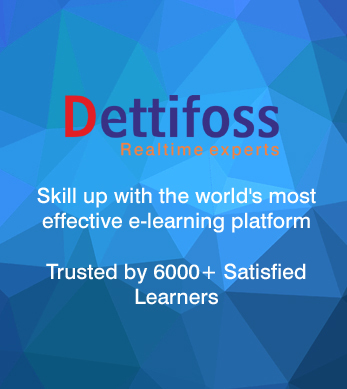 DettifossIT is one of the best software Training Institutes in ameerpet, Hyderabad. We offer various Software Courses coupled with 100% Guaranteed Job Assistance. Our Mission is to provide quality real-time software training to build good career path for our students. DettifossIT Services is considered pioneer in the filed of IT/Non-IT Training in Hyderabad. We are mainly focused on revolutionising learning by making it interesting and motivating. We provide range of career oriented courses for different segments like students, job seekers and corporate citizens. Our team of certified experts have designed our Service Now Training course content and syllabus for classroom and Online Training is based on current requirements from the industry. This enables them to be an Industry-Ready Professional, capable of handling majority of the real-world scenarios. DettifossIT Services also offer tailored made Service Now Training courses for Corporates. Our Service Now Training Centres in Ameerpet - Hyderabad is scheduled normally at a time that best suites you, we offer regular training classes (day time classes), weekend training classes, and fast track training classes. Our Service Now Training course fee is economical and tailor-made based on training requirement. Our team will make you confident & comfortable in cracking interviews. We also provide online servicenow training through which you can access our tutorial Anywhere, Anytime which is valuable and cost-effective. We provide a captivating interactive environment with dynamic content, e-Learning that not only effectively keeps people up-to-date, but interested as well. Its a One Stop Shop for all IT and Non IT Training in Telangana, Hyderabad. ServiceNow is a cloud based ITSM platform, which is used to automated our business process and provide business solutions to customer. New Graduates and working people have skill that industry demands. ServiceNow is emerging technology in this market and creating more employment and more demand. ServiceNow levels up to existing employee and new students with great knowledge and wonderful experience in cutting edge technology. This should be making successful career with some of India top MNC organizations (Infosys, TCS, CTS, Hexaware, Accenture, Capgemini, DXC, Birla Soft, Virtusa, Wipro, More…. are frequently using this emerging technology. ServiceNow Tool will enhance the efficiency and skillset of IT professional so that they can add up to productivity to the continuously evolving IT industry. This tool can be transform the business impact, speed in service, and delivery of IT. Deliver IT solutions and services that amaze your users, increase productivity, and achieve new insights by consolidating to the most innovative ITSM solution.Recently forbs given top 1 rank that is most innovation company in the world. Subscribe our newsletter get notification about new updates, etc.